When it comes to durability and longevity, slate outshines perhaps all other roofing types. A lot of homeowners love slate as a roof material because it is simply beautiful. No other material can match the timeless and classic aesthetic that slate provides. Unfortunately, not many people know just how versatile slate is when it comes to looks, and that’s why we’re going to explore the many different styles you can get with slate roofing. Larger slates carry away much more water than their smaller counterparts. By placing these wider slates at the eaves while slowly decreasing the size as you go higher up to the ridge, you can ensure that water is more efficiently channeled away during heavy rains. This is the main reason behind the use of a graduated slate roof, giving your home both the function of water resistance and the unmatched beauty of a slate roof. Compared to other materials, slate requires few roof repair calls and even fewer replacement needs. However, should a few slate tiles fall, crack or get blown off, a standard slate roof would be much easier to replace due to its fixed length and width. With standard slate roofs, the joints are lined up uniformly to give your home a cleaner and more organized look. At the polar opposite of the standard-sized slate roofing is the random width style. While the lengths are maintained uniformly, the widths and thicknesses vary, emphasizing the differences to produce a textured design reminiscent of old European architecture. To achieve this look, the slate roof is installed in pairs with one slate dropped by a few inches below another, creating a thicker appearance while staggering exposed butts. 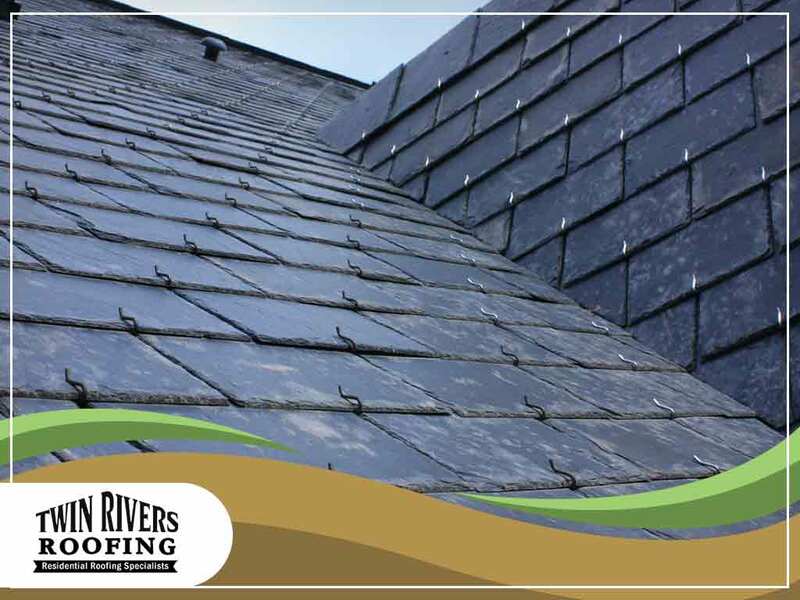 Our roofing specialists at Twin Rivers Roofing are more than happy to help you find the right style for your slate roof. Give us a call at (540) 899-7774, or fill out our online contact form to schedule a consultation and get a free estimate! We serve clients in Fredericksburg, VA, and nearby areas.